The advanced patient search allows you to search for patients using a series of predicates whereby you can build up your search based on “AND” “OR” statements. For example, [Patient age 40 to 65 AND had a GP appointment in the past 12 Months AND are male OR female AND have a BMI over 25]. 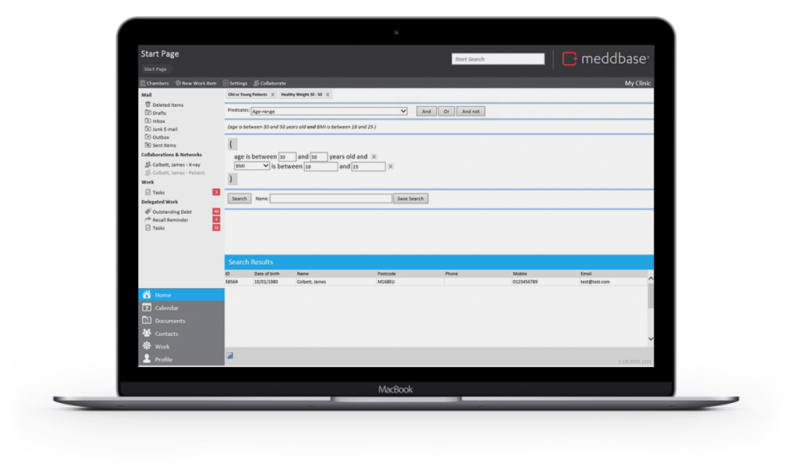 Meddbase will return a list of patients allowing you to further interrogate the record. Taking your analysis one step further, Meddbase allows you to perform an in-depth analysis on all clinical data where captured as part of a clinical episode, such as diagnosis or an outcome, or questionnaire data completed online by the patient. Using your data, you can cross map based on parameters and data fields of your choice. Unlike many other applications where bespoke reporting writing comes with a price, Meddbase empowers you with the tools to create your own detailed medical analysis reports at any time.